Anterior nasal packing should be performed on any patient in which direct pressure and vasoconstrictors are unsuccessful in controlling epistaxis. The use of nasal tampons, or sponges, is a very quick and effective method for controlling epistaxis. Nasal tampons, which are initially rigid, are inserted along the floor of the nasal cavity against the septum. They are made of synthetic, sponge-like material that expands to many times its original size after installation of saline or the absorption of blood (see Fig... . . .233-2). 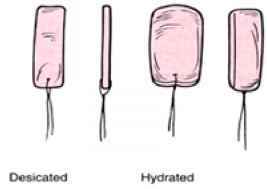 Insertion of the device can be facilitated by coating the tampon with water-soluble antibiotic ointment. This ointment will also help delay expansion until after the tampon is in place. Patients report such commercial devices to be significantly more comfortable than traditional gauze or balloon packing. This, coupled with the ease of insertion when compared to gauze packing, has made such devices very popular. Placement of a traditional anterior nasal pack may be considered when the bleeding is difficult to control, or other methods fail (see Fig 2.3.3.-3). FIG. 233-2. The Merocel nasal sponge in its desiccated (left) and hydrated (right) forms. 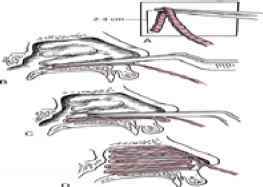 "accordion" manner, so that part of each layer of packing lies anteriorly, preventing the gauze from falling posteriorly into the nasopharynx. A. The first layer of 4-in. petrolatum-impregnated gauze strip is grasped approximately 2 to 3 cm from its end. B. The first layer is then placed on the floor of the nose through the nasal speculum (not pictured here). The beyonet forcepts and nasal speculum are then withdrawn. C. The nasal speculum is reintroduced on top of the first layer of packing, and a second layer is placed in an identical manner. After several layers have been placed, it is often useful to reintroduce the bayonet forceps to push the previously placed packing down onto the floor of the nose, making it tighter and more secure. D. A complete anterior nasal pack can tamponade a bleeding point anywhere in the anterior nasal cavities and will stay in place until removed by the physician or patient. Any patient who has undergone nasal packing may be considered for prophylactic treatment against toxic shock syndrome (TSS) with antistaphylococcal medications. Approximately 25 percent of properly placed anterior nasal packs fail to control the hemorrhage. 1 In such a case, emergency ENT consultation should be obtained if replacing the pack does not control the bleeding. Patients may also experience reflux of blood through the ocular puncta and need to be warned about this. 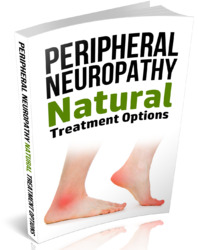 No specific therapy is indicated if this occurs. 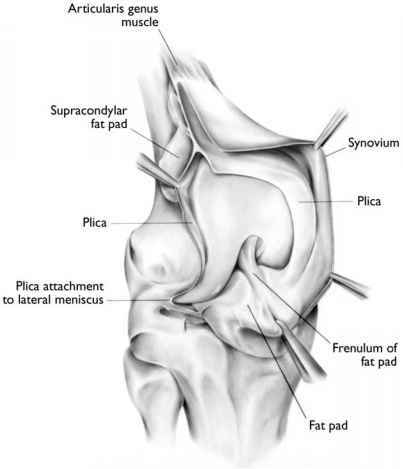 Anterior packing alone is a relatively benign procedure. Complications associated with anterior nasal packing include: dislodgement of the pack, persistent bleeding, sinusitis, septal necrosis, and, rarely, TSS. Any patient presenting after nasal packing with fever, rash, nausea, or vomiting, should be considered suspicious for TSS.